Kiwi magic lanternist and raconteur Arthur Meek delivers a lengthy trigger-warning prologue to his sly updating of Samuel Butler's 19th-century sci-fi tale, made in collaboration with Edinburgh's Magnetic North theatre company. The views we're about to hear on race and empire, he explains, are obviously abhorrent to us now, and as a straight, white male, he's the worst person to be tackling them. It makes for a startling, hilarious opening to Meek's gloriously tongue-in-cheek recasting of Butler's satirical tale, in which a gung-ho explorer finds his own beliefs seduced and colonised by the literally backwards values of the mysterious but utopian land of Erewhon, where women have the upper hand (just imagine! ), where illness is punished and crime nursed back to normality, where wealth is pitied but poverty prized. 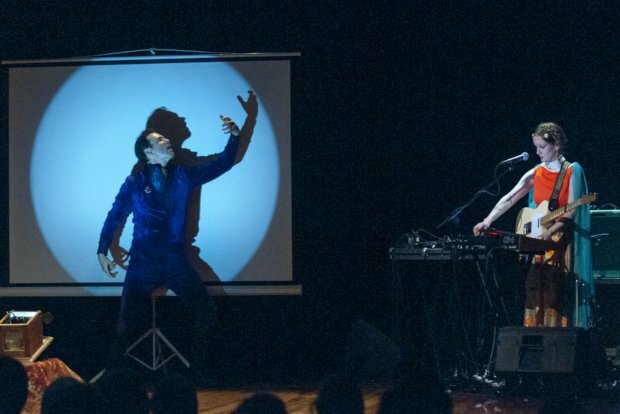 Despite his likeable magic lantern slides, it's Meek's droll storytelling that carries the show, supported brilliantly by the retro-futuristic tunes played live by Meek's compatriot Eva Prowse. The show becomes more opaque as it strays into time travel and the threat from conscious technology towards its end. But as a critique of colonialism, and a merciless send-up of hand-wringing liberal inertia, Meek's new Erewhon is a sublime achievement. Summerhall, until 26 Aug (not 13, 20), 1.25pm, £10 (£8).